Prince Andrew has a special talent for choosing friends. First there was the American millionaire Jeff Epstein, convicted for sexual relationships with under-age girls. 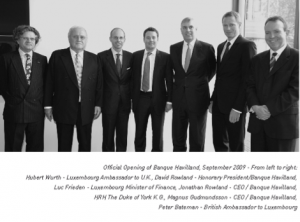 Now it turns out, according the Telegraph, that David Rowland, owner of Banque Havilland earlier Kaupthing Luxembourg, has paid off debt of £85,000 for the prince’s ex-wife. 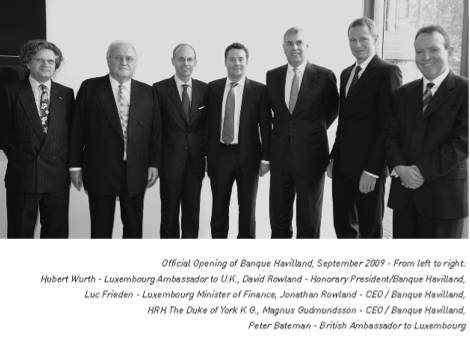 Previously, prince Andrew had attended the opening of Banque Havilland, as seen on this photo from Havilland’s annual report 2009. Rowland’s royal connection, in addition to his ties to the Conservative party is a further example of Rowland’s influence in high places although he, as quoted in the Telegraph article, has been accused of looting a company that he once bought in the US, Rowland denies this, and further has been called “shady” in Parliament. As long as leaders of the political parties are so in awe of millionaires with shady money and shady money supports political parties it’s a struggle to investigate people and companies that get rich in an opaque way. Something that The Economist highlighted in a brilliant satire this week. As they point out, “respectability is on sale” – and the best market place is indeed London. The ties between prince Andrew, Rowland and the Conservative party, the debt and indebtedness involved, are a case in point. Subscribe to comments with RSS or TrackBack to 'Rowland in royal company'.